Extend the reach of live and highly interactive training, while eliminating travel and facilities cost. Instructor and students can annotate on slides and images to share with other users. Includes Voice over IP (VoIP) and broadcast video. Video and audio feeds with ability to record the video/audio. Navigate presentation in both Sync and uncontrolled modes..
Interactive Quiz, with answer statistics. Admin: Schedule session, Send email to all participants about schedule. View results of test, View results of survey. Talk using microphone to presenter and other participants. Listen to audio from other participants. 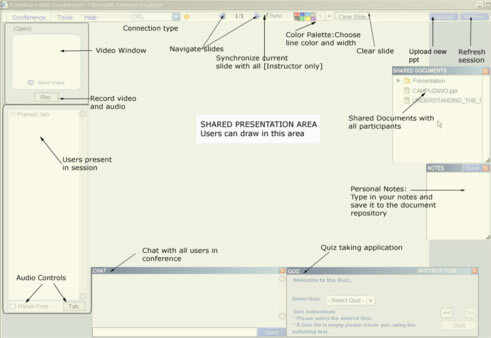 Open shared documents during training. Answer Quiz and see correct answer. After live training session, view the recorded video and slides.